It’s wasn’t a home ice 6-3 beating by Houston. Nor was it 7-0 shellacking by Texas on southern soil. It was, however, a loss by the Oklahoma City Barons to kick off a season. The Barons have yet to win an opening night game in their existence. 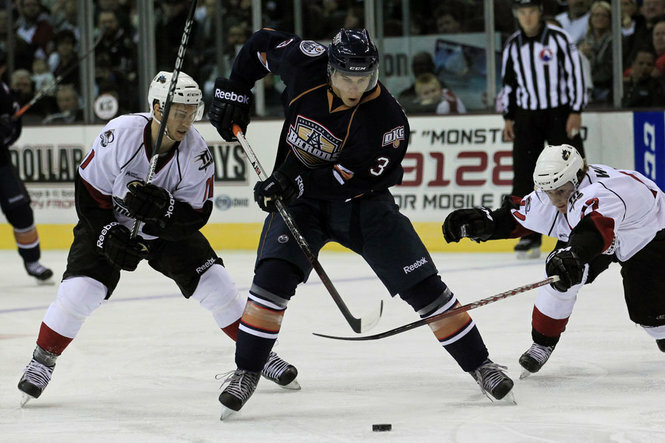 In a tightly fought game that was highly energetic on both sides, the Lake Erie Monsters defeated the OKC Barons, 2-1 in Cleveland. Huge attaboy to the Monsters, who had everything against them in their home opener. A new coach in Dean Chynoweth who altered the charge of the team to be more offensively chancey, two North American rookie goaltenders, and no Gabriel Landeskog likely equaled a tough season. But they came out prepared, sturdy, smart, and just good enough to beat the heavily favored Barons. The first period was marred by 22 total penalty minutes, with 10 of those being a weak fight between Dane Byers and Ben Wilson. Three power play opportunities for both teams, and three unsuccessful finishes kept the score 0-0 after one period of play. Despite the penalties, there were quick moments of really good hockey including a few by Justin Schultz, the Oilers offseason acquisition with bite. As well as Ryan Nugent-Hopkins who ended the evening with four shots, including one in the first period that should have gone in. A much more disciplined second period forced both goaltenders to be sharp. Yann Danis, looking to repeat as the league’s best goaltender, was solid. Maybe a smidge rusty, but solid nonetheless. On the other side of the ice, Sami Aittokallio a 2010 draftee and Finnish World Junior player, the goalie was absolutely fantastic. Untested in the AHL up until this point, he didn’t disappoint. He stopped 29 shots from a very persnickety group of Barons forwards. His defense aided in the effort as well. The second period saw both teams notch a goal. First it was Erie’s Bill Thomas, a former San Antonio Rampager known well by the Barons. Thomas just nudged a puck across the goal line behind the right skate of Yann Danis following a sweet shot from Brad Malone. For OKC it was Mark Arcobello that tied the game on the fifth power play opportunity of the game for his team. Justin Schultz eased in on the Monsters tender and unleashed a shot that bounced off a blocker and onto the stick of Arcobello who punched it in. The Barons owned the ice and the puck for most of the third. However, the Erie forwards continued to press things. Andrew Agozzino, a small, but skilled AHL rookie, toe dragged his way to a top shelf wrister over Danis’ right shoulder. The Barons ended the game with back-to-back power play opportunities, but it ended poorly. Monsters best Barons, 2-1. Same two teams meet tomorrow at noon. The Nuge and Eberle combined for 6 shots. No goals. But they are a much higher breed of hockey player. From how they move in open ice, to how they manage the puck around the net, these guys are NHL guys. Nice to see the confirmation, and realize just how good these players are in a comparative setting. Schultz is the same way. A defender that is both good at defense and offensive warbling is a precious commodity. Indeed he and Marincin were on the ice for both Monster goals, but that’s the nature of the beast when you have young, offensively gifted defensemen – they give up space. Danis was good, not great, but good. And that’s an encouraging sign. By my count, the Barons twice almost netted a goal that went across the goal crease. The most memorable was of Nugent-Hopkins who vivisected the goaltenders legs. The Barons score more on Saturday night. There were some jitters, but this team is a loaded jack-in-the-box. Defense remains the only question mark.